A two-judge Supreme Court (SC) bench headed by Chief Justice Mian Saqib Nisar on Sunday suspended a Lahore High Court (LHC) ruling ordering the revision of the nomination forms to be submitted by candidates for upcoming general elections. 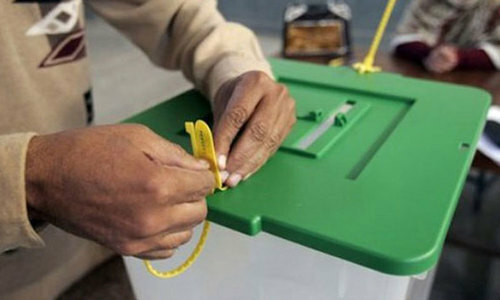 LHC Judge Ayesha A. Malik had ruled on Friday that the nomination forms do not include mandatory information and declarations required from lawmakers as per the Constitution and law, and ordered the ECP to ensure this information is included in the revised Form A ─ for election to the NA or Senate ─ and Form B ─ a statement of assets and liabilities. 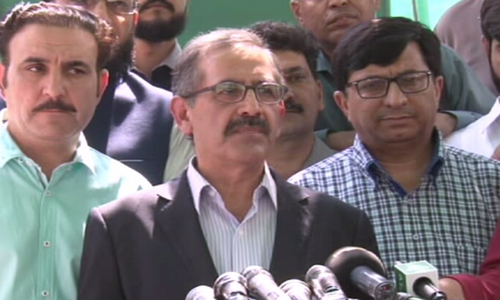 Hours after the LHC judgement was issued, the ECP said it had called an emergency meeting on Saturday to make decisions about improving Forms A and B, and directed returning officers across the country not to receive nomination forms from candidates on Saturday. The SC today suspended the LHC verdict after hearing appeals filed by the Election Commission of Pakistan and former NA speaker Ayaz Sadiq, after which the ECP immediately notified new dates for the filing of nomination papers and announcement of nominated candidates. In its appeal, the ECP had said that a date had already been set for the election and to make changes [in the nomination papers] would cause a delay [in the election process]. CJP Nisar, while handing down the order, asserted that the elections would be held on July 25, and "the ECP will be personally responsible if they are postponed". Sadiq's lawyer had taken a different line, arguing that only parliament has the right to legislate on any matter, including the electoral process. Following the SC's ruling, the ECP issued a notification 'partially modifying' its earlier notification regarding the election schedule. According to the new notification, nomination papers must now be filed with ROs between June 4 and June 8, and the names of nominated candidates will be published on June 8. The changes are also applicable to seats reserved for women and minorities in the NA and provincial assemblies. The initial poll schedule announced by the ECP had said that nomination papers would be filed from June 2-6 and a list of nominated candidates would be published on June 7. "All the remaining stages shall remain intact and poll will be held on July 25, 2018, as notified earlier," the ECP handout read. 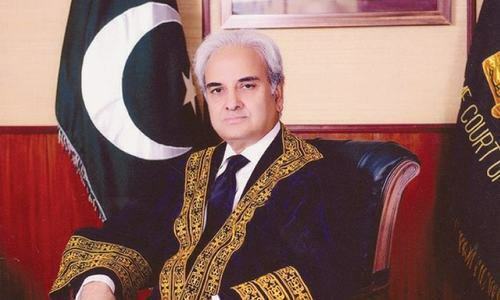 The SC's ruling comes a day after Caretaker Prime Minister retired Justice Nasirul Mulk had directed the Attorney General's Office in the law ministry on Saturday to file an appeal against the LHC decision. Sources in the law ministry had said that the Attorney General had been asked to file the appeal in the SC as the matter was of an urgent nature. Soon after taking oath as the seventh caretaker prime minister of Pakistan on Friday morning, Mulk had stated in categorical terms that the elections would be held on time and delay would not be allowed. Irony, if this decision will have serious implications. Who will be responsible for allowing criminals entering into the parliament? This decision will disappoint Pakistani public greatly. If they are not declaring all above mentioned then what are they declaring ???? The SC yet proves the propagators of conspiracy theories wrong. They want elections to be held on time. Having said this, all who are involved in this vicious circle of defaming the SC should be brought in front of the courts and held accountable for that. LHC had given a very right decision regarding election candidate form...SCP decision has no reason...now no one can stop looters to be elected. So now who is responsible to provide such an important missing information. Surely now criminals and defaulters will find an easy way to ENTER THE PARLIAMENT. This is called RULE OF LAW in Pakistan. It seems like an unannounced NRO has taken place between PPP, PML and more powerful sources. PTI wake up and look at the latest developments. Still time PTI boycott General Selections I mean General Elections 2018 till correct census and delimitations are done. The current census and delimitations done under the administration of Corruption Mafias PML-N and PPP are absolutely incorrect. In addition not allowing foreign observers during elections is a big red flag. Take action now. It will be too late afterwards. What a joke these elections will be, when all the criminals are eligible to contest. They will find a way to come back again in power and enjoy all the vvip class luxuries. Pakistan will decline further if elections will held without strict scrutiny. Would the world will comes to an end if the elections are delayed? So what, atleast do not allow criminals and dishonests in our parliament. Revival of Law of Necessity. Delaying election by 1 or 2 week will not jeopardize anything except that candidates should have provided complete information as per LHC decision. Strange and confusing decision, how a criminal can be MP? This means that a person who has criminal record and have made money through different means, paid no or little tax, has dual nationality and uneducated can submit his nomination papers for election without further enquiry. This is shameful and do not expect much from such elected MP's they will make more money and abuse the system - amazing and disgraceful decision! Irony of our corrupt law makers! Making laws to protect their past, current and future corruption. Sad, What's wrong with divulging such information about oneself, unless one is guilty of concealing some misdoings. As far as getting new nomination forms printed, the same could have been put on the ECP website and downloaded from there, the apprehension about delay in elections could have been put at rest. So now we as a voter would be barred from important information about the candidate we are voting for, how very unfortunate. Public should boycott the election under these conditions.nobody should be ruled by criminals. Good decision. Delaying factories would find now any other excuse. If Articles 62 & 63 requirements have been omitted than it would mean aqqama would become no objection. SC must share was LHC wrong or not ? suspension wont satisfy masses of pakistan delay or not to delay SC must tell people of pakistan concrete reason behind suspension. This is now a golden opportunity for PTI to make this an election pledge. Promise to repeal Election Act 2017 and to restore the old nomination papers if voters bring PTI in power. It's sad to see that Supreme Court has set suspended LHC legitimate order. ECP could have accommodated LHC order by requesting the revised forms printing on 24/7 days basis and simultaneously delaying poll by a week at the most. The modified form lacking critical information has now paved the way for any type of people to contest election. Honourable Chief Justice should have asked the Ex-speaker of NA that why in the first place in his capacity of the Speaker of the House he let the amended form pass through. It means that uneducated, corrupt and dishonest people with criminal records can contest the election. Wonderful! So virtually the next parliament will be the most corrupt in the history or Pakistan as all the checks and balances are removed from the background check. RiP Pakistan... Feeling shame to see this day. Wow. I cannot believe SC with its decision will allow any criminal, corrupt, dual national in the Parliament that will decide pakistanis future. What a shame democracy. What worldly gains could ECP officials and Ayaz Sadiq get by supporting the corrupt people. One day they will have to explain this and there will be no one to save them. Corruption at its peak. Its heart breaking. At least now I will not vote for this corrupt system. Great and outstanding decision by the wonderful Supreme Court of the Islamic Republic of Pakistan. Well done and keep it up. Does that mean that Pakistanis are all set to welcome yet another bunch of tax avoiders, duel nationals, liars, looters, thieves etc etc as their legislators. It is now for the (challenging) candidates and the media to publicize the info per the relevant items listed above but missing in the nomination forms about candidates so that voters know better who they want to vote. Consequences for not measuring up to the constitutional qualification criteria still hold whether or not one spells out in nomination papers. The only difference is the Cases will end up in courts to decide. This means that anyone who has criminal record, dual nationality, not paid income tax, does not declare his or her assets and source can apply for MNA and MPA membership. This is shameful and done to safeguard personal interests, and I strongly oppose this disgraceful decision! Beyond imagination how come all this important information is excluded? I fully agree with LHC decision to modify the electoral papers to include the full information about the candidates. It is a simple matter to modify the forms, and it should not cause any delays in the election schedule. The polititions are using the delay as an excuse. Also, I don't understand the sanctity of July 25. Even if the elections are delayed by a month or so, sky will not fall. The elections must be done right. A delay of a few weeks is immaterial. After this decision, i am not going to polling station. Its waste of time, better take a good sleep. CJP should explain to the nation; on what grounds he issued this verdict. CJP has given clean chit to the criminals and looters to rule Pakistan. The decision is good to hold elections on time. What is wrong with the new nomination forms? The old forms also facilitated criminals to step in the parliament. The changes in the forms make no difference By every means criminals will come in the parliament so why we insist on the old forms and clauses. With this decision; casting vote is not my priority. We have not learnt anything if 70 years; so why to hope for any change in 2018. That also means that timely election to gather the corrupt is more important than to have late but better class of parliamentarians. I as a voter can not be party to this game. Alas! Disappointing decision from Supreme Court without giving any solid reasons. @Sab Se Pehle Pakistan PTI was part of committee which has approved this reforms. We have waited for 5 years for fresh mandate, impartial and transparent elections, and the whole process is getting hijacked. Not just that, elections are held at the peak of the summer season in July, making the life of the voters miserable, and making sure that half of them don't show up. Fewer votes cast means that there will be more opportunities to rig the system. This is so strange, the same SC sent corrupt home and same is allowable my them to get back again. I don’t understand this game! And why should criminals, money launderers, tax evaders, UN-educated lead us and become our leaders? This is so sad! Our law makers only make laws to protect their corruption and to suppress people. What laws have they ever mafe for the common man......the country still runs on laws from the British era. The decision is contrary to the spirit of democracy. It is contrary to the rights of voters. Many are screaming at CJP regarding this decision. What we must appreciate is that he is the lone warrior surrounded by an entire country full of wolves. The CJP is doing his best, but it is the common Pakistani who is responsible for selecting those robbers to the parliament. There are 220 millions of you out there against some tens of thousands of this elite. If you do not want them, kick them out. But the common Pakistani is always worried about the education of their kids, or their jobs, or police or this and that, and hence dependent on this elite. Stop blaming the courts for not coming and saving your necks. You do not want to put any effort in or face hardship and then expect others to come and save you. The next time your local MP does a political rally, stand up and ask what he/she has done to deserve your vote. But you would not do this. Because you are scared. For your job. For your children. For whatever. And just happy in blaming CJP or whoever else. Period. One attempt down to delay the election. Let's see how celestial being come up with other excuses. Even a deaf & dump person can judge that the new ECP form has mala fide intensions. @Nitin read carefully it’s not a joke! @Dr. Salaria, Aamir Ahmad - I hope you are serious. I am a great fan of CJ but this decision has shocked me. Now it is a free hand for criminals, defaulters and liars to come to assembly and rule the masses. @Alex I second Alex opinion. I am not voting in this election where criminals have a free hand. To all those who are crying foul against this decision on the ground that this will open doors of the parliament to criminals: Nomination papers in all prior elections (2013 and before) had all these questions about criminal record and assets.etc. Did that stop criminals and corrupt from getting elected and getting into parliament? All these assorted questionnaires in the nomination papers haven't stopped corrupt from getting elected before and won't stop them in the future. The only one who can stop criminals and corrupt from getting elected are the voters themselves. @Sab Se Pehle Pakistan I don't think you are well informed but PTI was also a member of the election reform committee and they approved all these changes. Gates are open for same corrupt getting elected. @Dr Haroon - I fully agree with your views, but the irony is that so called common man is ignorant, uneducated and manipulated by corrupt politicians, dishonest bureaucrats and greedy businessmen through bribe and false promises. This is the ground reality and we all have to contribute and change this corrupt mindset through education and awareness and, it will be uphill challenge for all of us and future governments. This is only attainable through honest, loyal and totally committed leaders who are serious about nation's integrity, sovereignty and prosperity - I am optimistic and will do my utmost best expressing my candid views through different forums for the betterment of my county without any personal motive or supporting any party. My vote and support is for those leaders who care about the poor and the needy people and provide them education, health care, justice, clean water and job opportunities without any discrimination or greed. @Dr. Salaria, Aamir Ahmad Do you really understand the implications of this? What will happen if elections are delayed for few weeks? Important thing is, will these corrupt politicians will e back to the parliament or otherwise? It is unfortunate! At least the CJP shouldn't have suspended the LHC order ! It was important that this information be made available by the candidates.Otherwise once again crooks and looters would enter the parliament. Indeed the bipartisan parliament is the only place where laws can be made, if people are unhappy with those laws they should vote in a different set of people to take the place of the previous lot so that they can make different laws. Courts cannot overrule Parliament. Hidden NRO is taking place between all parties. You don't touch me I don't touch you. Sorry to see PTI part of it game over before start. Our establishment don't work then they panic at the last moment. @Mansoor Sajid What authority does the Chief Justice have to ask the parliament what laws that can enact? They do not get elected or rejected based on what they write on the form. Once they get elected, the process to oust them is a lengthy one. So these forms are irrelevant because whoever submits the form will be allowed to run. The ECP will announce everyone's name who has submitted the forms. ECP will not investigate every entry on every form before announcing their candidacy. The ECP is an independent body and the court did not interfere because ECP did not violate any lawmakers act. The courts are there to interpret the law and not to make the law. The legislature makes the law and the judiciary interprets it. The people of Pakistan should boycott these elections rather than elect corrupt and incompetent so called law makers. The future of Pakistan is doomed. The missing information is actually the most important information and any such omissions will allow thugs and criminals to be Pakistan’saw makers!! ECP should have looked into it long time ago !! It is a good day for corrupt mafia and very sad day for all those, who are honest, loyal and want a corruption free nation. I openly oppose the SC decision about the suspension of LHC's order relating to omitting income tax paid, dual nationality, record of income, assets and means of income source, etc from the application form - this is an open license to make more money through different means and nobody will question it's source! After doing all the good work why give in now. something is fishy. The best thing to show protest is boycotting the rigged elections. Stay cool at homes and don't suffer yourself for corrupt, looters, criminals in the sultry days. CJP would like to ink his name in the history for holding elections on time. No matter criminals and looters will be elected by the public anyway. The decision by SC has rightly exposed the real face of lawmakers and parliamentarians who has drafted approved and issued amendments in favor of electoral reforms 2017, revising form A and form B favoring the candidates and not the people who will vote. This is the irony of this country. Care Taker Prime Minister's quick decision to appeal against the LHC Decision on Nomination Forms, looks very very partial and in favor of out gone government machinery. Elections have been delayed in the past. Who would die, once the election date is changed. If the nomination forms are not changed to those of 2013 election, NA will of course be band of criminals once again. The fundamental informations are missing in the forms which is against the spirit of article 62(1)(f) of the Constitution. This is in line with the resolve that 'election must be held in time' OK. But the corrupts must not be happy they can go through the pulseraat easily without accountability. Let the tainted & corrupt submit their nominations papers, not only their papers go to trash, their destiny will be decided in ongoing cases till that time. The people of Pak must remain united against corruption, and let the judiciary dealt with the looters according to law. When the parliament annulled the requirement for the prerequisites, no one raised objections against it. Now they want to have judiciary as their savior? SC is the interpreter of the law of the land, it is not the formulator of the law. We are getting what we stood for - the corrupt and the thieves. Until and unless our people stand up for their rights and vote by their feet, there will be no chance of system change. You do not need more than couple of hours to modify the form and print it. This is how you can do it. Scan the current form save it and make it editable. Edit the saved form, include the new requirements and save the copy. Send it the printer in batch of five hundred. Suppose you need 20000 forms. You can print them in couple of hours. This is how democracy works. A lawmaker is the chosen representative of its electorate. Its electorate are those people who show up to vote in majority for that lawmaker. The lawmakers are therefore given the authority to put forward any new bills or ammend any previous laws. It goes through the parliament and senate to be signed off by the president. The lawmakers do not need any qualifications at all. They self proclaim that they are honest on the slectoral forms. The judiciary has to abide by the law. Is SC also going to suspend the cases pertaining to constituencies. What is the use of electrons if we don't have the right set of rules and areas clearly defined. Why the biggest court of Pakistan is keeping a blind eye on most important things that will govern the future of Pakistan. Why is the current election date so important. @Aamir if worry is that criminal will be elected, that decision has to be made by the people not by the courts. Do not vote for criminals. Does not make any sense by allowing a person to contest election without criminal background check. Even when you hire somebody you do the criminal background check before you offer that person a job. This is an unfortunate decision. The system is already rigged and now SC's this decision gives them full authority to loot the country. Now there is no hope of change. Blame SCP, blame CJP but don’t blame PML who are the architects of this atrocity. Let’s pass the blame where it’s due. Another one of PML’s satanic tricks to damage Pakistan. Now same criminals and corrupts,dual nationals,foreign assets holders will reach in assemblies.Now next five years same story will be repeated.People of Pakistan will suffer for next five year. Now corruption has been made legal. Verdict against Nawaz Sharif will be over turned. NAB is deliberately making silly mistakes in their case against Nawaz Sharif. Parliamentarians themselves have formulated the new nomination form. It is wonder that one is setting eligibility charitarian for his own selection. It is like that candidates for a job themselves set questions to be asked. It really beats the wisdom. Honorable SC decided the matter without listening the second party. I hope there is still time for a review. Secondly how easily ECP has accepted the infringement in its authority by accepting the new nomination form. I do not understand this fiasco in the election process. SC's decision may come back and haunt everyone including the SC. My personal opinion LHC was right. @Mahmood No no no, when is a law is passed with evil intentions it is the responsibility of the Supreme court to strike it down. Supreme court has to look into the intentions. What has the SC done? ECP is PMLNs B team. @Shafiq Shah, I don't think the Supreme Court gets invollved until afterwards when the law is challenged. You maybe teferring to a Suo Moto scenario where it can determine if a law is unconstitutional. In this case the lawmakers did not violate the constitution because self declaration of being sadiq anx ameen still exists in the application form. Lawmakers convenirntly got rid of all the other items which are used as their own benchmark for being sadiq and ameen. @King Akbar I was surprised with SC decision . Once the law are al agreed upon, the work of parliament and senate is done. It is up to the executive branch including the ECP to implement and abide by the laws. The courts are there to observe the fair implementation of the laws and decide among complaining parties. The parliament can not amend the laws while talking in the media or walking down the streets. @Amir the DIFFERENCE is that now people are AWARE and false disclosures will be basis for challenge. Just to say thanks to SC. @Aamir It's not court's role to allow or not to allow people from contesting polls. It's only responsibility is to ensure implementation of law and punish people who break it. It's people's right and responsibility to choose right people to represent them in parliament. We are openly inviting criminals and looters to come as elected members and loot more and commit more crimes. ECP should be held responsible for all this? why didn't they file a petition against this omission? and why anyone else didn't do that against this amendment? The change in the ECP forms approved by the outgoing Parliament is constitutionally unlawful because it takes away the right of the people from due diligence of the candidates who are seeking their votes. It is the basic principled right of the people that all public office holders and those who are seeking their votes to become their representatives disclose their assets and allow ECP to obtain their complete background information including character and criminal records.